A simplified cooking app for those who are aspiring to be more health conscious. because they find they lack good nutrition in many of their meals. An app intended to help users build a healthier lifestyle and eat routine, Superfoods has good intentions, but is text heavy and poorly oorganized. iHerb helps users find informations about certain foods. It goes into details about newer superfoods and is up to date. It helps with people who are informed and know a background of what they want but it does not feel as personalized. This cooking app was similar to my users' goals. The graphics were stronger but the organization was still a bit confusing. The payment allowed for upgraded features but without it, user is unsure of what’s available. I narrowed down True Dish's focus through affinity mapping. I conducted user interviews about eating habits, processes and lifestyles. After interviewing four individuals, I mapped out their responses. This search also helps users find new recipes through categorized searches or as they meander through the app. A recommendations list of recipes is built from ingredients users saved as their favorites. 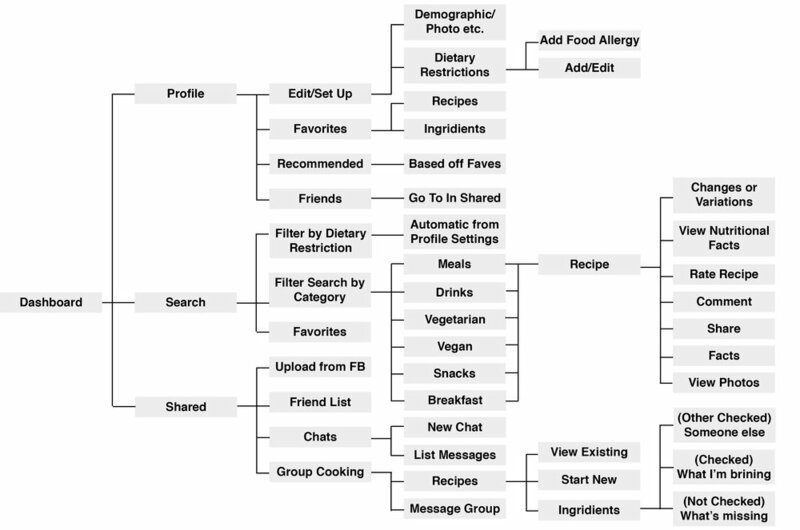 This will help users find better recipes they might like more quickly. Saving favorite ingredients or recipes helps developers build a user recommended list and also what’s most likely to come up first in a search. Users will find more recipes they like! While some users may not find this relevant, some may find knowing information about their ingredients helpful. Onboarding pages for new users, home page navigation and recipe example.